Hi! Does anyone know where I can purchase The Irish Times newspaper in London? Back in the beginning of June, I wrote a quick article on Jauntsetter about where to go & what to do in London. Jauntsetter is a weekly e-newsletter for New York women, packed with great travel tips & recommendations. Check their website out & see if your city has been featured! x . x . x . x . x . x . x . x . x . x . x . x . x . x . x . x . x . x . x . x . Well obviously, my first recommendation will have to be Broadway Market where I have my chocolates & cakes stall! It’s a once-a-week Farmer’s market in the heart of east-end London. It currently has about 80 stalls, a third of which are non-food stuff like cool vintage wear, independent designers’ hats, dresses, handbags, etc. Walk alongside the canal to get there or get a direct bus from Angel. You can buy goodies to take to the park opposite and mingle with the arty locals & young trend-setters. Soak in the bohemian atmosphere. Later, head to the pubs (on the market) where people spill out to the streets, sitting on pavements in the summer. Check out the British art galleries in style. First see what’s on at the Hayward Gallery (past exhibits include Bruce Nauman and Dan Flavin), then stroll alongside the river to Tate Modern. Head to the stylish top floor restaurant for lunch and insist on the window seat to enjoy the fantastic river view with St. Paul’s Cathedral opposite. Another Sunday fave is to go to Columbia Road Flower Market. Get down-to-earth mug of tea from a cafe in the courtyard on Ezra Street & enjoy the day. If you haven’t purchased any huge plants to weigh you down, head to Brick Lane (just a 10 minute walk away) to buy the famous bagels at the Brick Lane Beigel Bakery. It’s super cheap at 20p per plain bagel. People buy in dozens so that they can freeze them at home. The Salt beef bagel (£2.60) is also a legend. After you’re satisfied with a bagel, turn in to Cheshire Street off Brick Lane for serious bit of shopping in the small selection of independent shops such as ‘Shelf’ & ‘Labour & Wait’. If you go to the opposite side of Brick Lane, you’ll find yourself in the world of early Georgian architecture with narrow cobbled back streets (Fournier Street area). Think, Jack the Ripper walked these same streets back in 1880’s! Marylebone High Street is great fun. 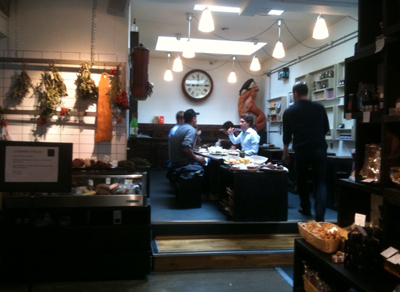 Browse Skandium designer furniture store and Divertimenti kitchen store, dream that you have hundreds of pounds to spend here and then do lunch with your girlfriend at La Fromagerie (2-6 Moxon Street, off Marylebone High Street) where you sit at tables amongst the delicatessen. If there’s room in your tummy, buy yourself a very decent hot chocolate from Paul and head towards Wigmore Street to check in on Margaret Howell clothing store. Then cross the road to St. Christopher’s Place to drop in on Marimekko to see if there are any good offers on their fabrics. …is definitely during the Open House event (this year’s dates are 19th & 20th of September 2009). There will be 700 buildings of architectural interest across the capital opening it’s doors, completely for FREE! You get to go in to places usually never available to public viewing! Dream-come-true for one nosy person like myself! And talking of being mentioned in other places, sometime back in February, this blog got mentioned in Time Out magazine! I was so proud. (Check out the article in their online archive). Many thanks to Lady C! A bit of press again! 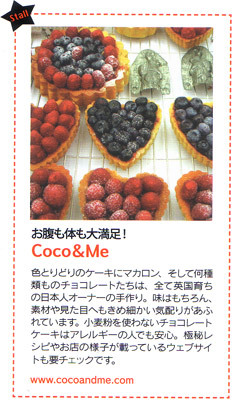 Last week UK Jack (Japanese newspaper circulating in London) featured Broadway market. Among the shops & stalls that they mentioned, they’ve also mentioned me! Thank you UK Jack! It’s amazing y’know, the power of media… – there were definately a much larger chunk of Japanese visitors last Saturday! I had many Japanese customers approaching my stall, telling me that they came because they saw the article! So how did I spend my time off? Well, er, nothing special really. Went swimming, & also to a shopping mall, & hang around the toy stores. I did a not-so-little (!) retail therapy for myself while he was happily asleep in the pram. Bought mainly clothes… Coz y’know what? I flippin’ deserve it – the last time I bought any garment for myself was around Xmas time! An article about me on UK JACK! On Wednesday last week, a Japanese Newspaper called UK JACK (a weekly publication circulating mainly in London) had published a small article about me! Click this link to see the jpeg in full size. Many thanks to Naoko-san, Kunichika-san, & Chie-san for making this happen. What prompted you to come to the UK? I came to this country when I was 6 due to my father’s work. At first it was only meant to be for 3 years. But have now approached the 25th year! What is your activity here? After graduating with a Graphic Design degree from St. Martins, I worked as a Designer for 6 years. Upon becoming pregnant, I had a lot of time to spend at home, which was when I realized my passion for making desserts. This passion saw me through a hobby to now regularly selling them! “To live each & everyday to the full”. Even when I’m feeling tired, or feeling down, I try to turn thoughts in to action. What do you love & hate about yourself? I like the part of me which obsessingly pursues what ever it is I’m ‘in’ to. But hate the part of me that is easily flustered & is stubborn/ obstinate. What do you love & hate about the UK? It’s very easy going here. I like that. But I dislike that there is a big gap when it comes to the quality of state schools available, & well-to-do families with more money to spend (ie: to afford to live in a good school catchment area) get better education for their children. What surprised you in UK? What three words describe London? Which tourist destination did you like? A small town called Padstow in Cornwall, & it’s surrounding areas. It’s quiet & peacefully still as if time had stopped. I buy fresh & yummy ingredients at Broadway Market & cook at home! What did you think was ‘good/ inspirational’ recently? Louis Hamilton of F1. His eyes remind me that of my son’s. I wish for my son to be able to have a big dream, have the strength to pursue it & ‘get it’, just like Hamilton did. Anything made you angry recently? I don’t get angry much. The Head Pastry Chef at the Waldorf. He gave me the astonishing opportunity to work in a five-star hotel kitchen – despite the fact I had no professional patiserrie experience what-so-ever! People like him who give chances to others selflessly is inspiring. A little embarassing to say, but it’s the love of my family…! What do you miss from Japan? Every Japanese people I know says MOS BURGER is really good, so I’d LOVE to eat it one day!! What would you like to take back to Japan? I’d love to turn my recipes & stories I write in my blog in to a book. I might even want to write a fictional novel… And when I have more time, develop the Coco&Me brand!